The Royal Institute of Technology (Swedish: Kungliga Tekniska högskolan, KTH) is a university in Stockholm, Sweden. 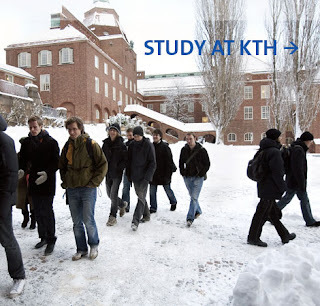 KTH was founded in 1827 as Sweden's first polytechnic and is with TKK in Helsinki, depending on definition, Scandinavia's largest institution of higher education in technology and one of the leading technical universities in Europe. work science and environmental engineering. In addition to the research carried out by KTH’s Schools, a large number of both national and local Competence Centres are located at KTH. Various research foundations also finance a number of research programmes. There are a total of just over 12,000 full-year equivalent undergraduate students, more than 1,400 active postgraduate students and 2,800 full time equivalent employees. 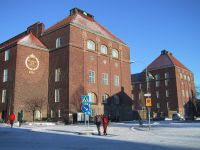 KTH was found as the Technological Institute (Teknologiska institutet) in 1827, following the establishment of polytechnical schools in many European countries the early years of the 19th century, often based on the model of École Polytechnique in Paris in 1794. KTH's earliest Swedish predecessor was the Laboratorium mechanicum, a collection of mechanical models for teaching created in 1697 by Christopher Polhem, who is considered to be the father of mechanics in Sweden. The models were used intermittently for teaching practical mechanics by different masters until the School of Mechanics (Mekaniska skolan) was founded in 1798. This is the year from which there has been continous teaching of technology in Sweden. 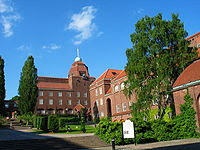 The activities of the School of Mechanics was taken over by KTH when it was founded. The institute had one professor of chemistry and one of physics, and one class in mechanical engineering and one in chemical engineering. During the first years, however, teaching was at a very elementary level, and more aimed at craftsmanship rather than engineering as such. The institute was also plagued by conflicts between the faculty and the founder and head of the institute, Gustaf Magnus Schwartz, who was responsible for the artisanal focus of the institute. A governmental committee was appointed in 1844 to solve the issues, which lead to the removal of Schwartz in 1845. Instead, Joachim Åkerman, the head of the School of Mining in Falun and a former professor of chemistry at KTH, took over. He led a complete reorganisation of the institute in 1846-1848, after which he returned to his post in Falun. An entrance test and a minimum age of 16 for students was introduced, which lead to the creation of a proper engineering training at the institute. In 1851 the course was extended from two to three years. In the late 1850s, the institute entered a period of expansion. In 1863 the institute received its own purpose-built buildings on Drottninggatan. In 1867 the regulations of the institute were again overhauled, and now explicitly stated that the institute should provide scientific training to its students. In 1869, the School of Mining in Falun was moved to Stockholm and merged with the institute, and in 1871 the institute took over the civil engineering course previously arranged by the Higher Artillery College in Marieberg. In 1877 the name was changed into the current one, which changed KTH's status from Institute (institut) to College (högskola), and some courses were extended from three to four years. Architecture was also added to the course programme. In 1915, the degree titles conferred by KTH received legal protection. In the late 19th century, it had become common to use the title civilingenjör (literally "civil engineer") for most KTH-trained engineers, and not just those who studied building and construction-related subjects. The only exception was the mining engineers, which called themselves bergsingenjör ("mountain engineer"). For a while, the title civilingenjör was equal to "KTH graduate" but in 1937, Chalmers in Gothenburg became the second Swedish engineering college which were allowed to confirm these titles. In 1917, the first buildings of KTH's new campus on Valhallavägen were completed, and still constitute its main campus. Although the engieering education of the late 19th and early 20th century were scientifically founded, up until the early 20th century, research as such was not seen as a central activity of an Institute of Technology. Those engineering graduates which went on to academic research had to earn their doctorates, typically in physics or chemistry, at a regular university. In 1927, KTH was finally granted the right to confer its own doctorates, under the designation Teknologie doktor (Doctor of Technology), and the first five doctors were created in 1929. In 1984 the civilingenjör course at all Swedish universities was extended from four to 4,5 years. From 1989, the shorter training in technology arranged by the municipial polytechnical schools in Sweden was gradually extended and moved in to the university system, from 1989 as two-year courses and from 1995 alternatively as three-year courses. For KTH, this meant that additional campuses around the Stockholm area were added. KTH offers programmes leading to a Master of Architecture, Master of Science in Engineering, Bachelor of Science in Engineering, Bachelor of Science, Master of Science, licentiate or doctoral degree. The university also offers a technical preparatory programme for non-scientists and further education.